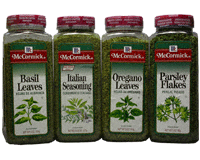 McCormick Oregano is the essential Italian herb. 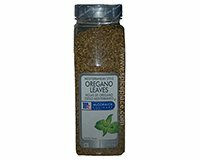 Oregano leaves are strongly aromatic with a slightly bitter, pungent flavor. This pungent flavor is composed of earthy/musty, green, hay, and minty notes. The herb imparts a slightly astringent mouthfeel. Its flavor and aroma are similar to marjoram and thyme but is stronger than either. Oregano is the dried leaves of the herbs Origanum spp (Mediterranean) and Lippia spp (Mexican). The Mediterranean variety is closely related to marjoram and is very similar in physical appearance. Oregano is not a subtle flavor. It is used in simple, earthy Mediterranean cooking and is essential for Italian pizza. 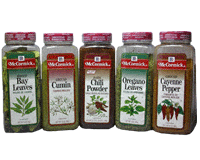 Mediterranean Oregano is found in much of the Italian cuisine: pizza, spaghetti sauces, and other tomato-based sauces. Mexican Oregano is found in chili powders and adds flavor to chili con carne and other Mexican dishes. Oregano goes well with tomatoes and is a natural with any tomato dish. Zucchini Soup II More Recipes..